Human society is divided into two parts. People whose point in the heart has awakened comprise a small part of humanity; this is us. The rest of the people do not have the point in the heart, yet a powerful egoistic desire is concentrated namely in them. Two forces, positive and negative, act in us. We move forward by creating a connection between our ego and the desire to attain the spiritual world, which we develop through the study and forces received from the environment. The connection built by combining these two forces is called the middle line. The rest of the people, as the science of Kabbalah explains, gradually join us, feeling that there is no alternative: Their egoism, demanding fulfillment all the time, will suffer. Over the course of human development man’s egoism was constantly growing and striving to fill itself as much as possible. Today, when the human ego has lost hope to obtain fulfillment, it faces a crisis. This encourages people to draw closer to us, although they do not know to whom and how. To make their path easier, we have to circulate the wisdom of Kabbalah and explain that there is a method of correcting the crisis. When they join us, together we will start working in the middle line and thus reach the world of Infinity. What will we win as a result? We will reach eternity and perfection. We will rise above our reality, above the point of the creation of our Universe and our entire world—to the upper reality. Nowadays, the point in the heart awakens in many people: There are millions of them already. And the people whose point in the heart has not been revealed yet feel the crisis in addition to egoism. They sense that they lack the positive force without which they cannot live. They know that they have to correct the crisis, they feel that the solution is hidden in unity, but do not understand how to realize it. In a global and integral world, everything has to be unified; nature demonstrates this to us. Today, it shows that we have to reach the world of Infinity, that we are one whole. This is precisely what the crisis covertly points and directs us to. In people who should lead humanity to this goal, the crisis reveals the point in the heart, a positive force, which they can obtain from the group and studying. With its help, they can move towards the world of Infinity independently. And those whom the crisis does not give the force of unification but who feel that they lack this force will gradually get explanations from those in whom the point in the heart has awakened, will join them, and together with them will aim for the goal. The only creation is the desire that appears “from absence” by virtue of the Light and gradually reaches its condition. At the beginning it simply wants to enjoy, but later it starts to understand that it is completely under the rule of this desire. This is how desire grows gradually until it realizes its full opposition to the Light. The first time, it happens during the 4th phase of the expansion of the Direct Light, in the state called Malchut of the world of Infinity. It seems to us that the breaking is something negative. But in reality it is the other way around. Because of this, the creature understands its full inability to be like the Creator. In order to become a giver and be similar to the Creator in the state of breaking, it lacks only efforts. Later, it will be able to reach bestowal and rise from a much worse state. However, firstly, it has to experience the realization of evil, prayer, work, good deeds, and until it has all these, it will not be able to become equal to the Creator and to be like Him. Until the creature has obtained the spiritual vessel, that is, has obtained the understanding and sensation,feeling its own effort and the realization of desire, it is impossible to say that the creature is similar to the Creator. The little one cannot be a giver. He can do something small, play with his toys. But if he really wants to become like an adult, he has to develop a variety of sensations in himself. Thus, after all the spiritual and historical development given to us as a preparation from Above, we discover that two desires are co-existing within us: our own and an additional desire. A human within us starts with this. One’s own, natural desire pulls a person towards the pleasures that he sees in front in him. The additional desire pulls him to special, spiritual kinds of pleasure; however, he cannot feel anything besides pleasure. We see in a person of our world his material, physical body. It is not about it, but about the desire drawing him in two directions. One is directed to what is revealed to a person in his or her five sense organs. The other is called “the point in the heart,” and it’s still unclear to a person to where this desire is drawing him and whether it is worth using it. From the moment these two desires are manifested in a person, he is called a human. Because of these two states, he can become similar to the Creator (Edome), that is, to be called a human (Adam from the Hebrew word “Domeh” or similar). One needs only to find out about the means, to learn how to use these two desires awakened in him or her. One desire is old and is called an “old and foolish king,” the other one is new and growing like a “smart child.” If one wants to deal with them correctly, this is possible only with the help of the upper force. Thus, he cannot advance on his own and needs a mentor. Everything is given from Above: People are led to the right place to study; all the necessary conditions are created for them so that they can accept this guidance and use it. Everything is given from Above except for the effort that we have to add ourselves! These efforts build a human. It is as our sages [a sage is the one who has attained the Creator] said: “Anyone who is saddened for the public [as for himself and before himself, exactly for this reason] is rewarded and sees the comfort of the public.” The public is called “The Holy Shechina (Divinity)” since public means a collective, meaning the assembly of Israel, since Malchut is the collection of all the souls. [That is, the one who exerts himself for the correction of the collective soul merits the comfort of seeing it]. Question: Can people who don’t feel any desire for spirituality associate themselves with our message of unity? Answer: Yes, they can. There is plenty of serious content that talks about the necessity to unite. Thinking people do understand that egoism is destroying the human race, while humanity is selfishly destroying the Earth, and that is why we must switch from egoism to unity and rise to altruism. Only then will we learn to get along with each other and save our planet, the only home we have. After all, we can’t move to another “apartment.” Many world authors describe this picture with clarity and precision. The issue is how to make this transition. It’s evident that humanity is on the verge of war and faces a gloomy future the insatiable ego is pushing it to. The solution is also obvious: be “good children,” “befriend one another,” restrict consumption, and learn to distribute resources properly. But how do we make it from point A to point B if human nature is the desire to enjoy? How do we reform it? How do we turn it into bestowal? It is one thing when we talk about basic instincts such as maternal love. But people don’t usually feel this way; love rises only when trouble comes, out of necessity. Hence, we need to try to open their eyes so they may see how serious the situation is and to show them one specific condition: The world will escape demise only by way of unity and mutual participation. Then, left without a choice, they will agree to it. However, carrying out this transition requires that every moment, in every detail, every tiny particle, each crumb of bread and droplet of water, a person will clearly feel: If I don’t share it with others, I am dead. It should permeate every feeling, action, and choice. This is the way it ought to be. And the reason for it is one: In his or her egoistic desire that is constantly looking to be pleased, a person feels that he will drop dead if he succumbs to egoism. If the situation is a bit different and death is not instant, he’ll steal. Such is the nature of man. We can’t ask of man what is beyond his power, above his nature. So it seems that everyone should fear this? It is impossible. In “Introduction to TES” Baal HaSulam writes that in the ancient times, Kabbalists resorted to asceticism, as it is written: “Live on bread and water, sleep on the ground, and labor in the Torah. If you do so, you will be a lucky man.” It follows that even on the path of such sufferings you need the power of the Torah. Otherwise, you must constantly feel misfortunes hanging over you: Either unite or perish. This is why Kabbalists explain that while undergoing such painful states, a person should “labor in the Torah.” After all, you still have to draw the Light that Reforms. If not, there is no life, and there is no choice. Any hero in this world can be easily fooled. We live by egoistic sensations, and anyone can be made to respond in any way you wish them to. After all, man is the will to receive, not a hero. Therefore, it is up to us to provide the solution for them. People will think they found it on their own, while in reality, it will be coming from us. And the faster we advance, the easier it will be for us to prevent them from being fooled. We have to rely on logic and explain that we employ the inner force of nature, the power of unity, the life-giving force that breathes life into everything there is. All our definitions must be brought a bit closer to people so that they don’t start thinking that we are talking about some supernatural force working beyond the nature of things. No, it underlies nature itself and stands by to assist us. Question: The global crisis has already announced itself publicly. When will the public start asking questions about what’s going on? When will the storm come? Answer: This depends on us. We have to do our best to disseminate the method of our correction. Our message is simple, and we can offer it to the governments of the countries that are already in trouble. 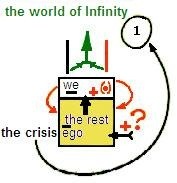 The key problem is what to do with the sky-rocketing egoism. A human being has a normal, earthly desire to be provided with all that is necessary for his existence. He needs food, family, and the other things he can’t do without. Besides that, his egoistic desire aimed at receiving more keeps growing. It is so inherent in every one of us that we can’t even define what a basic necessity is. Will a person be satisfied if he receives his daily bread, so to speak? No, he will not. What do we do with egoism then? What can we fill the black hole with? 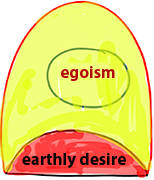 The answer to this is as follows: Egoism grew so that we can transform it into spiritual desire, a spiritual vessel filled with attainment, bestowal, love, and finally with the upper Light. How is it done? How do we make a transition from a society of receivers, insatiable in its quest for material wealth, to a society of minimal consumption, grounded on basic needs? If we don’t, the world will not be able to exist due to our rapidly depleting the planet’s natural resources. Consumerism will not be able to satisfy our egoism anymore. The people of the world won’t be able to shop store to store, filling their carts “to the gills.” The feast is over, and from now on, everyone gets only what he or she needs. How then do people get fulfilled? We have to send all these millions to school. They will receive all the necessary goods in exchange for their studying. Otherwise, they are not entitled to even that much. And indeed, why should they be? Trouble is trouble, and everyone is in it. The government provides them with basic necessities, everyone continues to live where they do, stability is preserved, and at the same time, everybody starts studying. What do they study exactly? They study the laws of life in the integral system. In reality, they are the laws of the group, but Kabbalah is not mentioned during the lessons. The subject is systems and mechanisms pertaining to a unified society. Getting all that they need, at least during the class, people hear and study the facts proving that we don’t have another way to survive but through unity. You are dealing with “savages” coming to learn, who wish only to make money and get certain benefit. But gradually, they begin to understand there is no other option, that we have entered a new system, and that the world will develop differently now. Consumerism is finished; this type of society is dying out. It didn’t live that long anyway, at maximum for a hundred years, from the end of the 19th century through the 70s-90s of the 20th century. And even during this time there have been crises, including the Great Depression of the 30s. Thus, people begin to study, while the government provides them with all they need, which is much less costly than creating new jobs. The latter is pointless since nobody will be buying what may be produced. Besides, the raw materials and energy are almost gone. Thus, the most concise and cheap solution is to send people to school, regardless of where it may be: at home via the Internet, in theaters or auditoriums, or anywhere else. The key is to place everybody in an educational framework. In the meantime, studying is going to make one wiser and allow him to understand that he is entering a new world, where the previous laws do not work. Baal HaSulam writes it as well: We must all go to school and learn yet again how to live in the future. Eventually, thanks to the studies, people will gain a new desire and start perceiving changes in it, until they come to understand that fulfillment can come from another, higher degree. The process will be gradual since we are dealing with a gigantic mass which is beginning to ripen. It will truly transform us as well. As of today, we don’t have any other options. This is why no one can find anything. But just imagine how much Light these hundreds of millions can draw by merely listening to what they are taught. This is the solution that Baal HaSulam is pointing at, the solution that suggests itself to us logically since there aren’t any other means except for bringing people a little closer to the Light.